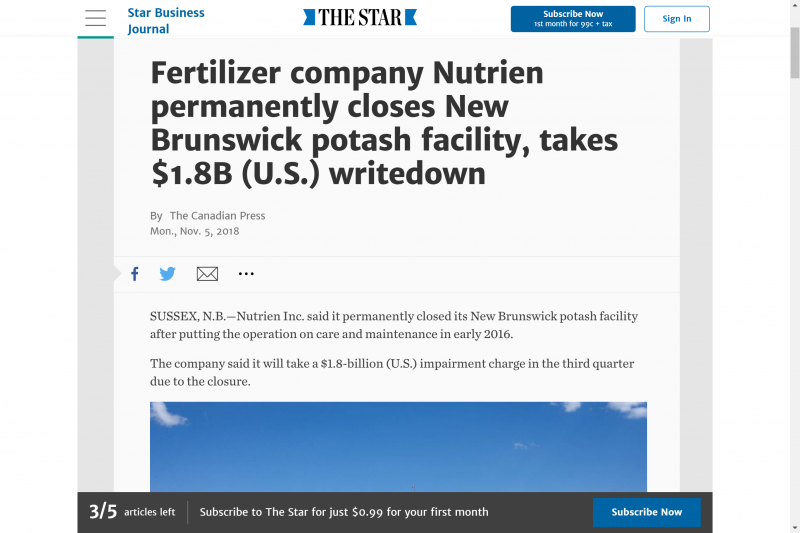 SUSSEX, N.B.—Nutrien Inc. said it permanently closed its New Brunswick potash facility after putting the operation on care and maintenance in early 2016. The company said it will take a $1.8-billion (U.S.) impairment charge in the third quarter due to the closure. It said the decision to close the facility reflects the company’s ability to increase potash production at a significantly lower cost than resuming operations in New Brunswick. Nutrien, then known as the Potash Corp. of Saskatchewan before a merger, shut down its Piccadilly mine near Sussex, N.B., at a loss of about 430 jobs close to three years ago to focus on its lower-cost operations in Saskatchewan. The news was a shock at the time for the town of 4,300 after Potash Corp. had spent around $2 billion (CAD) and six years building the facility.